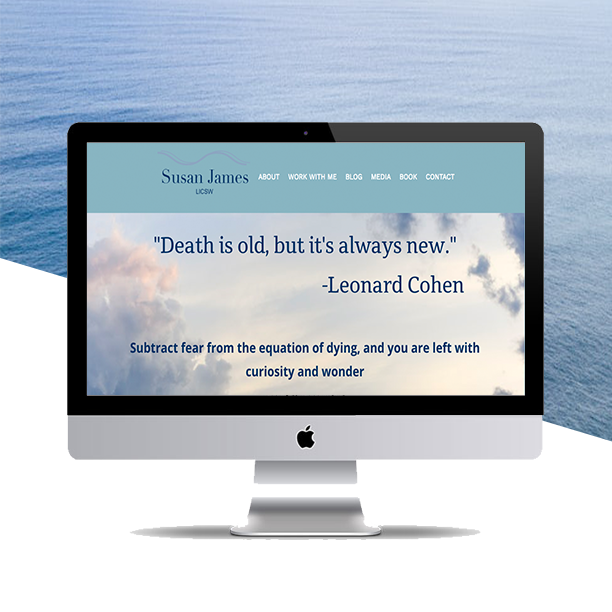 Needless to say, I was delighted to take on the challenge of creating a beautiful brand and website for Susan. In the end, we decided on a Branding and Web Design bundle and I was ready to get to work! First things first - creative research! We both gathered some photos that we had in mind that we were thinking would evoke Susan's brand best. Grace à Unsplash (hands down my favorite free stock photo search engine! ), here are a few of the photos that I used as inspiration for the brand. Next up - my favorite part of the branding process: the mood board! To create Susan's beautiful mood board, I incorporated elements from the stock photos I found via Unsplash, as well as some of the colors from the color palette. I loved how the brand already evoked a feeling of total calm and serenity. I felt that it was extremely important considering Susan's sensitive work - often working with individuals who may be facing obvious fears and stresses at the end of their lives, as well as their loved ones. Along with the tranquil nature of the images and colors, Susan and I also wanted to include an optimistic exuberance in it all for a powerful combination. Et voilà! The finished product! Susan worked with a wonderful photographer to get these beautiful photographs, and that's definitely one of the reasons that this design is so stunning and clear! If you (or someone you know) are interested in learning more about Susan's work, you can find her right over here! I'd like a new website and brand!